The school played a key role in the development of the African-American communities in Wellington and nearby towns. 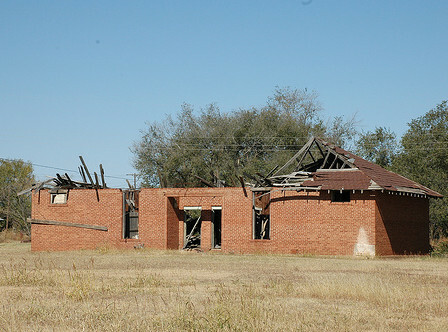 The Booker T. Washington School is believed to be the first brick school for African-American children in West Texas, and the two-room structure cost $5,000 to build. The first senior graduated from Booker T. Washington in 1951. Alumni held their first reunion in 1983 and attracted 300 ex-students to Wellington for a celebration that has grown into an annual event. The restoration would provide a focal point for African-American residents and visitors, especially as the alumni association becomes stronger. Most importantly, it can be reborn as a living testament to the courage of African-American people in the Texas Panhandle who struggled against prejudice and ignorance to make better lives in spite of the obstacles placed in their paths. And for younger residents who have no experience with segregation and officially sanctioned oppression, it can provide a living history lesson and a warning to future generations. The building itself is a ruin, with no roof, and failing walls. The roof structure has completely collapsed, threatening to pull in what remains of the walls. The City of Wellington has secured the site and has offered assistance in keeping it clean and keeping the grounds mowed. The City of Wellington and Historic Wellington Inc. have offered their help in preserving the site and are hopeful that the current owner will donate the property, but no agreements have yet been reached.